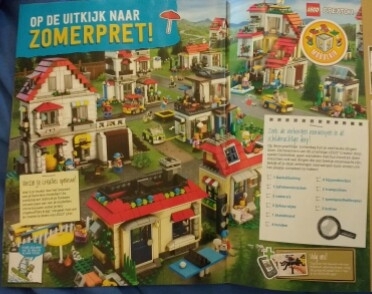 They've rather slipped under my radar, but what do people think of the new Creator 3-in-1 Modular Buildings, #31067 Modular Poolside Holiday, #31068 Modular Modern Home and #31069 Modular Family Villa? Are there any pictures online of them all together? I wasn't able to find any discussions about them, after a quick, basic search of the forums. I'm rather tempted to get all three, as they are pretty well priced at £19.99, £27.99 and £44.99, respectively. Out of the 3 I like #31069 as a possible project for expansion although out of the smaller building sets in the 3 in 1 line, there is something about #31065 that really peaked my interest as a possible 3 - 4 set big build. The back wall appears to have been dropped from the Creator line. Jang has a video with all three of them together. I struggle with the 3-in-1 Creator sets as I love them all for the most part. I just feel like by the time I buy all three, I'm a few bucks shy of one of the Creator Expert modulars with so much more detail. I pretty much only get the smaller ones if I find a deal. 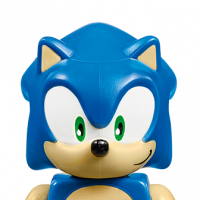 To me, this seems like some unholy hybrid between the Creator series and something like the "easy to build" Juniors stuff. The Creator 3-in-1s already have a great product with builds like the Corner Deli or the Park Side Townhouse. I don't quite understand the need to be able to pop walls in and out and swap stuff around - why wouldn't you just take the model apart and build your own thing? Seems like a little too much spoon-fed creativity. Though I suppose the ability to combine multiple sets, like we saw with the LBM series, is an interesting element. I like them, but at a price that is 30% off of RRP (which is one thing I like, that these are discounted often unlike their bigger counterparts). The issue I have is set like the townhouse is really more of a building facade, and not really a house. Yeah I know that Classic LEGO sets were like that too, but for the money I would like a bit bigger of a building. these sets are very bad unfortunately. The sets even look worse then the sets of 2-3 years ago. Specialy the "villa" is disapointing,looks so small,details to much out of scale,just ugly. Or that bay window house,where the bay window is as thick as the rest of the house. Really very bad this year. LEGO did make much better looking small houses years ago already (like appletree house). even now LEGO still make Nice small house,the log cabins all look good and Well designed. they have to do better with the creator town houses imo. I'm generally a big fan of Creator houses, but these three don't appeal to me visually very much. They are chunky and awkward looking in terms of design, and the color scheme is a bit boring. I guess they were going for a retro "Classic" LEGO feel with the blockiness and primary colors, but it ends up looking boring compared to the more sophisticated design and color schemes that our modern LEGO sensibilities have become used to IMHO. However, I do really like the "modular" idea in principle - seems like it would be fun, especially for kids, to recombine the modules in various combinations. You can have a different house every time you play. When my daughter was a toddler we had a Duplo set that worked kind of like this - she absolutely *loved* it. Of course for some adults, it might seem easier just to part out the bricks and do a MOC if you want to combine sets, but for kids (and perhaps many adults), the fact that you can create many combinations so quickly will be very appealing. So I do like how all three sets work well together and can be intermingled. So still on the fence on these. I was originally planning on picking them up at some point IF they get heavily discounted, but now with all the other awesome giant sets that are being announced (Ninjago movie/Carousel/Fishing Store... not to mention all the City and Elves sets we want...), these may get pushed off my list. I've been looking at pics of these again and mulling it over and I think I agree with the general consensus that they're a bit of a mess. Similarly, I might pick them up at a good discount for parts etc. To me, this seems like some unholy hybrid between the Creator series and something like the "easy to build" Juniors stuff. Absolutely nailed it and brilliantly put. I have all three and I was very excited at a possible 9 houses to add to Brickadelphia. So, my thoughts on them now that I've built a couple of them: I like the concept behind the skeletal core that you use as a starting point. However, the pop-in wall and window sections tend to like to pop out just as easily. I've replaced mine with standard plates so they are in permanently. As for the open back, that's been a hallmark of LEGO sets forever to make playability easier, and I don't necessarily mind it as long as the open back is placed up against the back of another set so it doesn't look as ridiculous. To be totally fair, there are a LOT of sets with open backs that don't seem to be complained about: every fire and police station, #70912, literally all of the Friends buildings, and I could go on. So that doesn't phase me. One of the biggest criticisms about the CITY line is the lack of buildings that aren't police stations, fire stations, etc. Even when there are buildings that you'd find in a normal city, they tend to be part of some sort of action scene: #60008, #60140, etc. There's literally nowhere for your good citizen mini figures to live. So if you're looking for buildings to flesh out a city, these sets do provide a really good starting point. For double VIP points or a good discount, I wouldn't simply write them off. Looks to me like they were designed for kids to play with, rather than being primarily static models designed for AFOLs to build once and Kragle together as a display. As MrJackson noted above, sections pop in and out easily - perfect for kids when their minifigures want to go indoors. Kids play with these things? Well, there is #60097. They also have the new Bus stop and last I checked nothing nefarious was going there, or at the gas station, fun at the park, or fun at the beach either either.. So there are city sets that do have common city principles. Anyone notice that on the main image of #31069 the fireplace is on the right but the chimney is on the left? Or am I missing something? In the Lego club magazine they had a whole village made from these 'modular' builings. I am like above posters usually a big fan of the 3 in 1 things and I think its a good idea kids can mix and match with these, am I going to buy them myself? Mhm, maybe at a discount. ^ Personally, the lack of technic pins leads me to say no (unlike Ninjago City). ^^ We could classify them as Modular Juniors. With no baseplate or Technic pins then no they are not Modulars. I notice the chimney's also in illogical places in a lot of the other pics showing different layouts for that set. Either they were thinking of it purely as a decorative feature rather than considering how these things practically work, or they assumed kids wouldn't be bothered about things like that. I can't quite say I have been too much of a fan of these modular sets but I must say #31081 is great! Love the idea for this one, especially the rock wall! ^I love the idea for it as well, but not the final product... like many said before, the ‘juniorised’ feeling is nothing for me, so I won’t be getting them. I’m afraid this is the end of the line for the Creator 3in1 building sets with the style that started with Bike Shop & Café...? What do you guys think? I wonder how long it will take for someone to be outraged by the spraypaint cans and graffiti on the upper level of the new #31081. I have to agree with you. Loved Bike Shops and Cafe (ended up getting 3 copies to 'modular-ize' it), and I also enjoyed the Grocery Store and especially the Corner Deli. But the main reason I got them all was to change them, so seeing these Creator houses is a little disappointing but it won't hurt my end goal. I'll still grab them once they are on sale or clearance and then modify them as I wish. IMO, the new Modular Skate House shows a lot of promise for this new series of buildings. It's neat to see the modular system branching out into such a unique-looking building. Love the colors and the rock wall construction. That said, unlike the previous ones, this one does seem to ditch the modular concept for its B and C models, the arcade and skate park. Between that and the arcade being perhaps the least enclosed Creator building to date, I can see it being unpopular among AFOLs except perhaps as inspiration for their own arcade builds (the arcade machines and basketball game are quite charming). Something else that stands out to me about the set is that it's got more new printing than I'm used to seeing in Creator 3-in-1 sets! Between the graffiti brick and TV tile in this set and the new printed torso in the Daredevil Stunt Plane, I'm wondering if new printing in Creator 3-in-1 sets is something we'll see continue to expand. I agree, though I'm not sure 'Junior-ized' fits this as it seems more of the design team using details and pieces that are typical LEGO building parts. They seem to be more cheating a bit and really now make 'facades' of building but yet LEGO seemingly 'asking' you to pay for a whole building. The nice thing is that eventually retailers do discount these, unlike a typical modular, so you can sometimes get 2-3 for the retail price of one (or close to it) and you can build one shop out of three sets. I’m not a big fan of the new modular style but as was mentioned above they are a good parts pack when you can get them for 40-50% off. I wouldn't say there's much difference in value between an open-backed building and a closed-back building as long as you're getting a fair value in bricks (in terms of weight, piece count, complexity, etc). To AFOLs who buy a set to build and display, maybe an open back might feel like being cheated, but to a kid, opening up the back for more play value and then using the difference in wall bricks to either lower the price point or expand and furnish the model seems like a win-win. In the U.S. modular family vila is priced at 69.99$ the price is not that good but the other 2 are much better priced 29.99. I havent done this yet but i plan on buying 3 of each of the smaller ones and 2 of the bigger one. 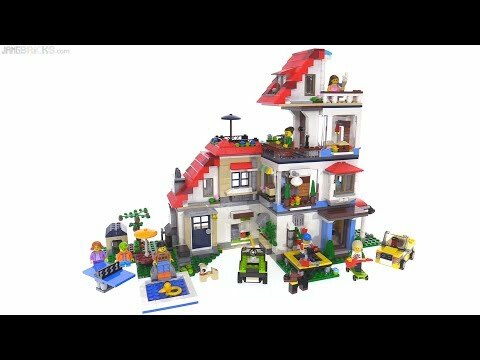 To me its just really fun to buy the lego houses and make neighborhoods with them.